I recently made three quilts for the three daughters of friends of ours. I've not shown their quilts yet - either the tops or the finished quilts. I did manage to finish these quickly, so I'm skipping the top stage and just showing the finished quilts. I'm starting with the middle child - rarely do they get to go first, right? I'm a "middle child" but with 5, I guess there are three of us in the middle! This is also the first of the three quilts that I made for these girls. Our friend's 8 year old girl loves big cats - especially cheetas and leopards. She also loves blue. Naturally I fussy cut the big cats so that she didn't get a tiger with his head cut off right in the middle of the block! 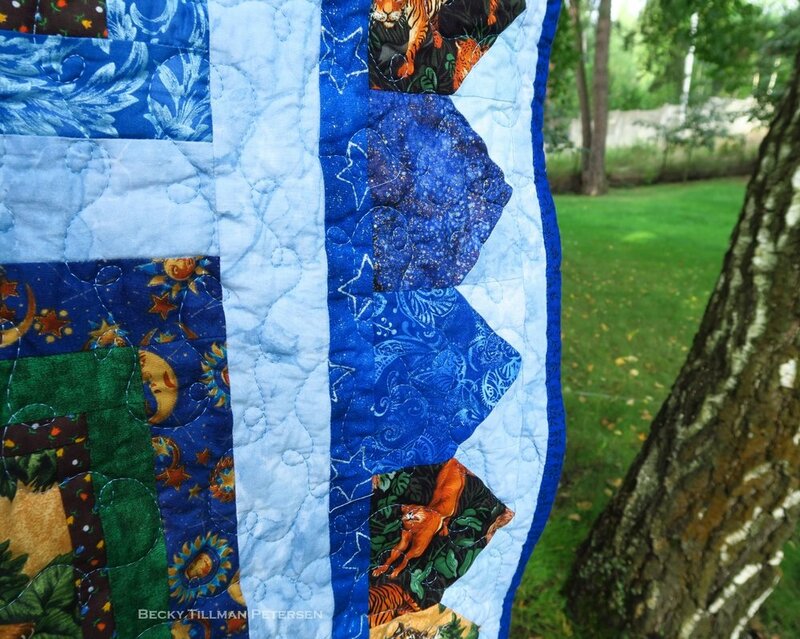 I mentioned in my other blog post where I showed the fabrics I used that I didn't want her to doubt that this quilt was blue - her favorite color. So i was generous with it! I did simple loops quilting. There are a couple of reasons for this. It's quick and easy, AND I know it will hold up to the rigors of multiple washings! 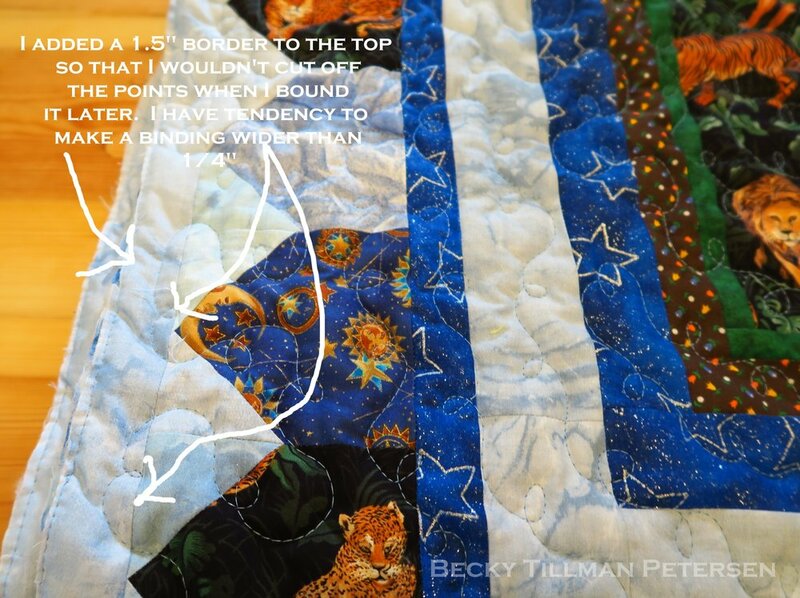 When I made the pieced border, I was afraid I would cut off my points - well, in fact, I knew I would cut off my points since I tend to make more like a 3/8" wide border and not a 1/4" border. So, to avoid that problem, I added a small 1.5" strip of fabric as another border to the outside of the points before binding! It solved that problem and my points were saved! Here you can see the brown calico I used. It is a quite old print - old fashioned, but not so old it's actually "in". But never mind - it had the right colors in it and that is what was important to me. 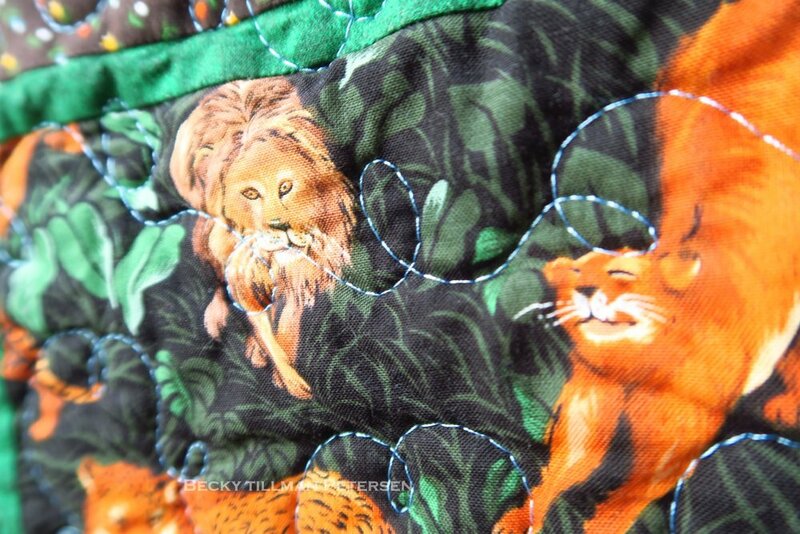 The orange - went with the color of the big cats, the brown, green and blue were the exact right colors for this project! I'm so glad I found it in my stash! I knew when I was making them that some of the border blocks were a tad bit light. Then after making it I saw that they were really too light. I decided, however, to not take them out. 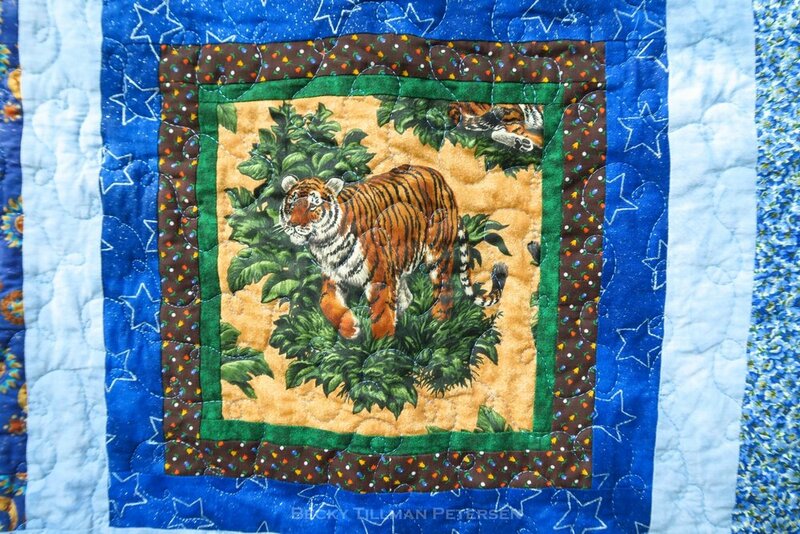 I considered that I was making this for a child who should, if she is a typical 8 year old, will be thinking about the fact that her quilt has big cats and blue on it and not that the border has some blocks that are too light for the design to show up as it should! 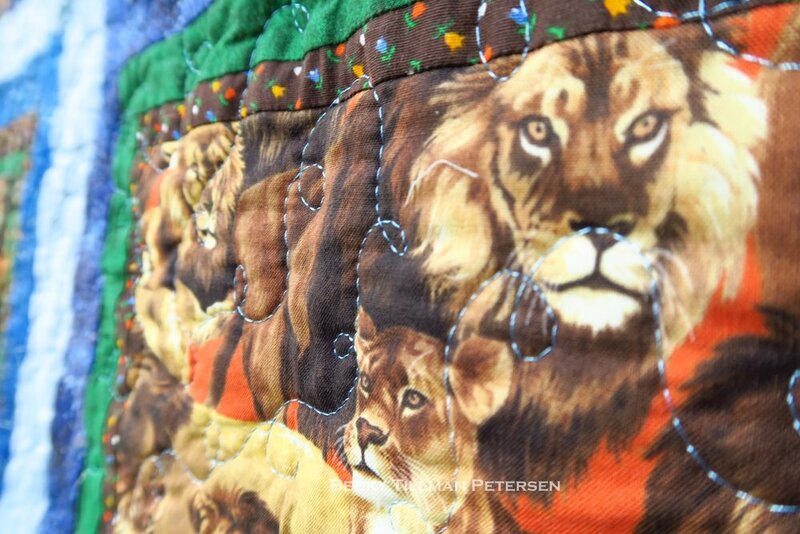 Here's another close up of the blocks with the quilting. You can see the variety of blues I used very well here. I did keep the same light blue as a constant. I was trying to keep the main thing, the main thing. I didn't want to chop up my beautiful animals into tiny little pieces. I've seen little kids when they get new bedding. They aren't looking at the piecing - they are looking at the motifs! 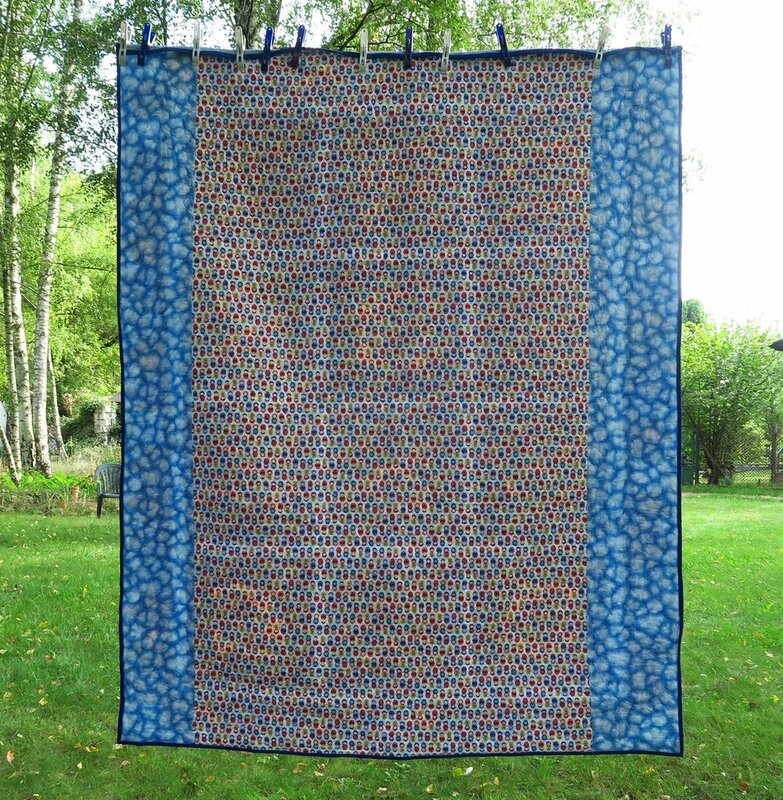 It would be an extremely rare case where an 8 year old would comment on the actual design of the quilt as opposed to the fabrics used! I've not seen it yet. I did see a little older girl- maybe 11? who was fascinated by the design and the quilting and ran her finger down it as she examined one of my charity quilts - I thought she'd make a great quilter! You can see that I alternated the coloration of the blocks - using some green and some brown as a very thin border around the block first. I did this to try to tie my blue into the big cat fabric, which was not even a tiny bit blue! And of course with the beautiful summer we've had, we have nice green grass. Thought you'd like to see it! When making the back, I thought about incorporating a little cultural nod to it. I centered the piece of the doll fabric and added some borders to each side - trying to do the best I could in a low tech manner (matching centers while sandwiching) to keep them even. 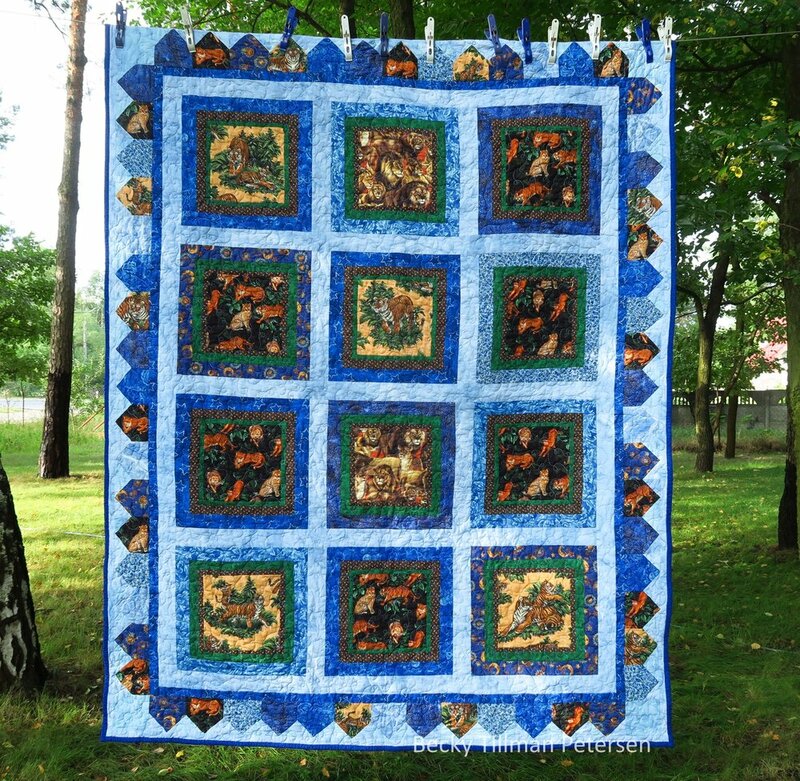 This way the quilt is a reversible quilt - one side with a lot of piecing, in this case, big cats, while the reverse side has the Russian dolls and blue which is a completely different "feel". If you haven't gotten some of this yet, you are missing out on some adorable fabric! Yes, they are small - but so what? They are just as cute as can be! It's Robert Kaufman and only $4.99/yard! I knew that you would want to see it up close as well as from a distance, so here it is. I did get the pattern finished and it's on this page. Just look for the pattern "It's a Parade"! As usual, I like to show a quilt roll. It's a much smaller quilt roll than I normally have because the quilt is a lot smaller than I usually make, but here it is! You can see here that I used a variety of blues to go around the outer section. I used all the same green and the same brown, however. And that's what's been happening in my sewing room lately - as least one of the things! Be sure to check out what my sis has for you in the store! She's trying to keep you quilting affordably!